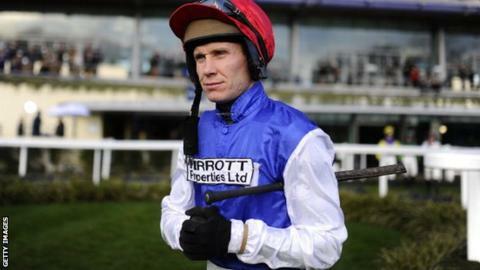 Perennial runner-up Richard Johnson says he will "give everything he's got" in an effort to finally become champion jockey in AP McCoy's absence. Johnson, 37, is the bookmakers' favourite to win a first title in 2016 after 19-time winner McCoy announced his retirement on Saturday. Asked how often he has been second to McCoy, 40, in the championship, Johnson told BBC Sport: "More times than I care to remember. I'm not 100% sure. I think it's at least 15 or 16. It could even be 17. It's around that figure." The figure is actually 15, and likely to be 16 when the jump racing season ends in April, but the pair share a mutual respect and friendship, although Johnson admits he has sometimes "loathed" McCoy after being beaten. Here, Johnson talks about reaction to McCoy's retirement, the pair's relationship, his own ambitions and the horses he is looking forward to riding at the Cheltenham and Grand National meetings. Johnson has won the Cheltenham Gold Cup - on Looks Like Trouble in 2000 - and Champion Hurdle - on Rooster Booster in 2003 - but says being champion jockey would be his biggest success. "Without doubt, I will be giving it everything I've got. It's the one thing I've always wanted to do - that's been my goal since I started when I was 16. It would be nice if I manage to do that. "To be champion is the best accolade you can have as a jockey. It shows consistency and hard work through a 12-month period. You have to be committed. "I know I'm definitely at the end of my career, not the beginning of it. It is a case of how you feel yourself with injuries, which tend to play a major part in the decision, about when it's time to finish. "For me, I'm fit, healthy and enjoying it. I ride for nice people and have good rides on a regular basis. I've no intention to retire for the foreseeable future. McCoy won his first title in 1996 and has been champion ever since. Johnson was runner-up for the first time in 1998 and is set to be second for the 16th time in April. "We know each other very well. We sit next to each other in the changing rooms most days of the year. "We are both determined to win when we get out there, and want to beat each other as much as anybody else. "The great thing about AP to me is he's the same today as when I first met him. For any young jockey starting off, or the general public outside the weighing room, he has time for everybody. "He's literally one of the lads, who has been fantastic for racing." Johnson has ridden more than 2,800 winners in his career. Only McCoy, with more than 4,300, has more victories among jump jockeys. "I've been lucky and privileged to ride with AP. He has taken race riding to a new level. He's definitely the greatest jockey I've ridden with and the history book will say he's the greatest jump jockey ever. "It's been amazing to be a part of that. He's a great friend and always will be. I have a lot of admiration for him and massive respect for what he's achieved. "I've always tried to be champion jockey as hard as I can. Some years I have got closer than others. "Hopefully I have been a good influence on him but I think he's been a massive influence on every other jockey riding. It has made other jockeys more dedicated, more focused on everything. "He's got an awful lot to be proud of, on and off the racecourse. I couldn't speak highly enough of him. "He is one of the hardest men I have ever known. He would put himself through anything to achieve what he wants to achieve, but you could see it was very hard for him to come to that decision to retire. "It's going to be an odd sensation when he's not there after April. As much as I loathe him sometimes when he beats me, he is very much someone I enjoy being around. "It's going to be an emotional time until the end of the season for him and the rest of us." McCoy has ridden 200 seasonal winners nine times in his career, including a best of 289, and Johnson knows it is a numbers game - the most victories wins the title. "I rode 186 winners one year. I've never ridden 200 but I think that is the target I will be looking to get near. "I know the bookies have prices on all of us but you'd be hard pressed to pick a winner. It's going to be a hard year. "Without AP, it is going to be a much more open race and there will be a few lads who think they have a realistic chance of getting there. "It's going to be a very competitive race and fingers crossed, I have very loyal trainers and hopefully I'll have a great chance." Was part of him happy his rival retired? "Oh definitely, without a shadow of a doubt. I would love to have been champion jockey and beaten AP. It would have been the ultimate thing for me to do. "But being champion jockey would be my best achievement. With him not there, it makes it easier, and a small part of me thinks he's had enough now, he should enjoy retirement. "Whatever he decides to go and do, I guarantee he will be a success, whether he goes on TV or radio or in to some other line of work. He can do the school run a bit more often." Johnson, who rides mainly for trainer Philip Hobbs, is looking forward to next month's Cheltenham Festival and the Grand National at Aintree in April. "Cheltenham is a fantastic four days. I'd be hard pressed to give you just one of my horses to follow. "I've got lots of good rides. After Cheltenian's run in second in the Betfair Hurdle at Ascot on Saturday, he would have a great chance in the County Hurdle. "Balthazar King was second in the Grand National last year. He is really well and it will be his target to try to go one better. He has all the right credentials and he'll be the one I'm looking forward to."